Sorry for the delay, Wendy fans, but we have some exciting news to share and we had to wait one more day for he good news...Today is the release of Wendy's NEWEST products...WooHoo!!! This month's challenge is going to be a little different...we're only sharing the cover of Wendy's new catalog, aren't the colors divine (and they're going to help me hold on to warm weather just a little bit longer), and Wendy has posted the full reveal, with projects on her blog! Your challenge this month is to visit Wendy's blog and create a project inspired by one of hers or one of her new products. Be sure to share, in your blog post, what product or project inspired you. The challenge ends on Thursday, September 24 at midnight (EST). A random winner will be selected from all of our participants and announced here on the blog on Friday, September 24. You may enter multiple projects, however, your name will only be entered into the drawing once. This month's sponsor is...Ranger! Ranger will be awarding one winner, chosen from a random drawing, a prize pack of Wendy's products. Interested in sharing your ART? We'd love to see what you create based on Wendy's new products! To share, just add your blog post (the specific post, please) link below. Once your project is listed, you'll be entered into our drawing. Thanks so much for playing along this month! 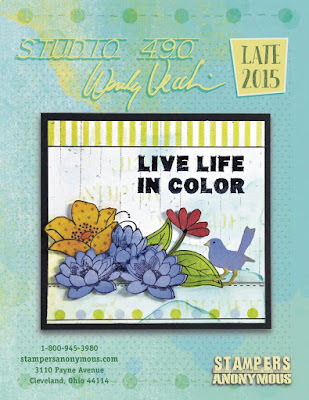 I am so excited to be able to use my Stamp It Stencil It set for this challenge!! Loved looking at Wendy's new releases and her samples. Every one of them was inspired and inspiring! I chose the purple and blue colors from a few of the samples using the new Stamp It Stencil It sets. Thanks for this lovely challenge!! !